Nobody does drugs in Lu Over the Wall, but watching it you get the sense that everyone responsible for making it might have. You could chalk up the film’s unbridled strangeness and unfailing whimsy to demographics. Distributor GKids is selling it as “family friendly,” which it is, an innocuous, offbeat alternative to the conventional computer animated joints typically found in modern multiplexes. 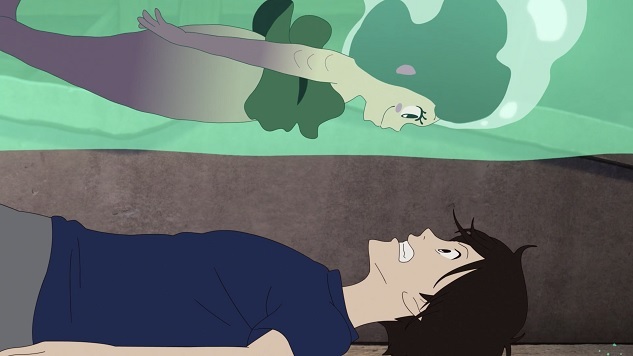 But there’s “whimsical” and there’s “weird,” and Lu Over the Wall ventures well past the former and into the latter before director Masaaki Yuasa gets through the opening credits. It’s tempting to assume everyone in the studio dropped acid during production and scribbled their hallucinations on celluloid. Or then again, maybe Yuasa’s team is just imaginative, and maybe they bought into everything Lu Over the Wall is selling without thinking twice. Frankly, if you worked on a production this cheerfully eccentric, you’d get caught up in its idiosyncrasies, too, if only because there are so damn many of them. Barely a moment goes by where we come close to touching base with reality: Even its most human beats, those precious hints of relatable qualities that encourage our empathy, are elongated, distorted, rendered nigh unrecognizable by exaggeration. Lu Over the Wall isn’t a movie that takes itself seriously, and for the average moviegoer, that’s very much a trait worth embracing. The plot is both simple and not: Teenager Kai (voiced by Michael Sinterniklaas in the English dub), recently relocated from Tokyo to the quiet fishing village of Hinashi, spends his days doing what most teenage boys do, sullenly hunkering down in his room and shutting out the world. When he isn’t sulking, he’s composing music and uploading it to the internet for all to listen to, and they do, especially classmates Yuho (Stephanie Sheh) and Kunio (Brandon Engman), two overenthusiastic but well-meaning rock ’n’ roll aspirants. They have a band. They want Kai to join their band. Kai, of course, would rather be left alone, but when you’re a city kid in a tiny podunk town, locals tend to exoticize you even if you’re just an average adolescent. As Kai struggles with his self-imposed isolation, he befriends Lu (Christine Marie Cabanos), a manic pixie dream mermaid wrought in miniature. It’s his music that draws her to him, you see, because what kind of merfolk can refuse funky homemade beats? She forces an introduction, he plays some tunes, her fins turn into feet and she dances. Naturally, Kai finds the whole thing completely counterproductive to his “gloomy loner” brand, but Lu is adorable, and eventually he warms up to her (and also to Yuho and Kunio). But Kai’s friendship with Lu has its limitations as well as dangers: Merfolk, like vampires, can’t endure direct sunlight without getting flambéed, and Hinashi’s townspeople don’t take too kindly to the fish-legged. What’s a solitary emo boy to do in a literal and figurative fish-out-of-water plot that’s buttressed by xenophobic overtones? Lu Over the Wall blends joy with political allegory with vibrant color palettes with storytelling magic, plus some actual magic, plus too many upbeat musical interludes to count. Describing the film merely as “creative” feels like an insult to its inspired madness. Picture Steven Spielberg, Hayao Miyazaki and Bob Clampett all running madcap through each others’ movies. Such is the effect Yuasa has produced here, E.T. colliding headlong with Ponyo and Looney Tunes, caroming from teen angst to adult ennui, musical comedy to fantasy. Lu Over the Wall isn’t nostalgic, per se—Yuasa never seems to be pining. He just loves the mode those movies work in, and thus has made his own contribution to their traditions. Resisting the film’s charms is stiff, but why would you want to? What other movies in theaters feature a bipedal shark decked out in bespoke suit, or abrupt shifts in visual style from slack and carefree to curvy and precise? One moment we’re watching anime. The next we’re watching old timey cartoons that suggest the geometry of Bugs Bunny and Porky Pig. If the filmmaking is a bit bloated for its own good, the elasticity of Yuasa’s cartoonish vision makes up for it. For a kids’ film, and even for an adults’ film warehoused in a kids’ film’s trappings, Lu Over the Wall is a tad overlong, a sub-two-hour effort that would have worked better clocking in at 90 minutes. The padding adds occasional listlessness to an otherwise energetic story. But padding poses little obstacle for a film this propulsively loopy, and Lu Over the Wall’s excesses don’t stop its essentials from delighting the viewer with colorful earnestness. Does the experience improve under the influence? Possibly. Then again, Yuasa’s work is effectively intoxicating on its own merits, squiggly and colorful, animation off-kilter enough to send you on a cinematic trip so long as you let it wash over you.